Salted Caramel Apple Nachos are your new favourite quick snack or dessert for the family – or just you. Sprinkle and drizzle them with tasty toppings and be crunching away in no time. Plate licking is positively encouraged. Apple nachos are not a new thing, but if you are someone who occasionally craves something sweet and crunchy, this is all the reminder you need. Enjoy them with just a drizzle of salted caramel, or go full-nacho and load them up with my menu of toppings. The images you see are what I fancy, but honestly the add-on options are as broad as your imagination. 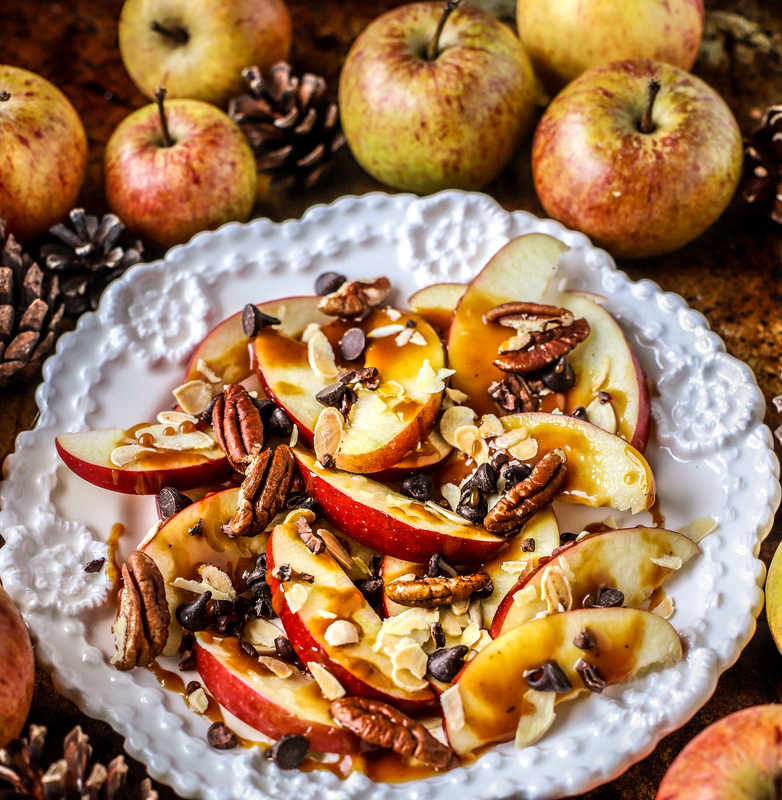 Slices of crisp, sweet apples drizzled with an even sweeter dessert sauce, these fruity dessert nachos fall somewhere in between a super healthy apple (not something I ever crave, tbh) and the decadence of spooning salted caramel sauce straight into your mouth (that can’t just be me). They make a super after-school snack, too. Kids love them. Adults love them. And the best thing is that you probably have all of the ingredients. Or will be highly motivated to go and get them. It can’t be that easy, surely? Yes, it is. You can buy sweet caramel sauce or, of course, make your own. Go vegan or dairy – it’s up to you. But everything else is store cupboard stuff: mini dark chocolate chips, cocoa nibs, chopped toasted pecans and toast flaked almonds. More ideas below. The main thing is to choose firm, crisp dessert apples and slice them just thick enough to hold your toppings without bending when you pick them up. I find that half moon slices as opposed to rings are more stable in the plate-to-mouth journey. Two other tips are 1) toss the apple slices in lemon juice to stave off browning; and 2) warm the sauce before drizzling. You are talking 5 minute prep, tops. This is the last-minute dessert option that will everyone will love. So, what other toppings can I use? However you top them, I really hope they become your go-to fruit dessert. **Remember to follow me on Pinterest and, if you make these Salted Caramel Apple Nachos, click on the pin at the bottom and leave a photo of your make with a comment telling me what you think, or any awesome changes that you made. Similarly, any Instagram posts tagged @food_to_glow using my recipes will go on my Story if I see them. I’m always so proud when you share my recipes with the world. Yay!!! Nice pictures. I am hungry. What absolutely stunning photos Kellie! This has to be the perfect autumn dessert – can’t wait to make it. Have pinned. Goodness me, your photography is stunning Kellie. As for the dessert, it’s a big yes please from me. Is it greedy to have all the toppings? I actually daren’t show your photos to my kids because they would start begging me to make these immediately. You have captured these apple nachos beautifully. However, I fully intend to surprise them with a plateful very soon – maybe even for Guy Fawkes Night. I love the idea of taking something as simple as an apple and turning it into a delicious dessert. Your photos are beautiful and so Autumnal. I have no words….this simply looks incredible!! Ever since I saw the picture on your Instagram I’ve been dreaming of eating this all week! Going to try this weekend. Thanks for sharing! This is so brilliant Kellie. These apple nachos look absolutely stunning and gorgeous. What a perfect autumn treat this is. Beautiful and so wonderfully seasonal, a fab idea for all those apples.